Pace Gallery, New York (50012). V. Linhartová, Antoni Tàpies, London 1972 (illustrated pl. 50). A. Franzke & M. Schwarz, Antoni Tàpies, Werk und Zeit, Stuttgart 1979 (illustrated pl. 138, p. 132 and incorrectly dated 1967). A. Agusti, Tàpies, The Complete Works, 1961-1968, vol. II, Barcelona 1990, no. 1608 (illustrated in colour p. 331). Paris, Galerie Maeght, Antoni Tàpies, November 1967, no. 6. Vienna, Museum des 20. Jahrhunderts, Antoni Tàpies, March-April 1968, no. 72. This exhibition later travelled to Hamburg, Kunstverein, May-June 1968, no. 61 (illustrated pl. 54) and Cologne, Kölnischer Kunstverein, July-August 1968. Paris, Musée des Arts Décoratifs, Peintres européens d'aujourd'hui, 1968. The present work formed part of a travelling exhibition circulated by the American Federation of Arts, 1969, no. 23. This exhibition travelled to New York, The Jewish Museum; Washington, National Collection of Fine Arts; Chicago, Museum of Contemporary Art; Atlanta, The High Museum and Dayton, Dayton Art Institute. Paris, Didier Imbert Fine Art, Paris Capital des Arts, April-July 1989, no. 61. "I felt the need to demolish the over-estimation of the human being: to destroy it, as well as aspects of humanism in the Western sense. I wanted to show that the human being is not privileged, but is only a part of the universe; his nature is the same as that of the heavenly bodies, or piece of paper, or a leaf of a tree. Nevertheless, I don't think it's quite true that human representation has disappeared from my work." ('I am a Catalan' 1971, repr. in, Stiles and Selz Theories and Documents of Contemporary Art, University of California Press 1996, p. 9). In the mid 1960s aspects of the human figure which Tàpies had consciously removed from his work in the 1950s began to be reintegrated into the iconography of his paintings. Fragmented body parts, items of clothing and other dismembered objects appeared in the highly textured surfaces of his canvases as away of suggesting the integrated nature of existence and of conveying a sense of the traces of life and humanity that had through the artist himself, interacted in the process of creation. This new approach to his work reflected Tàpies preoccupation with the dual nature of his role as both creator and viewer of his art - as both an initiator and a receiver of his art. It is this role that is specifically addressed in Blue with Four Red Bars. Against a freely painted pale blue surface, Tàpies has delineated a few key symbols, chief among which are the artist's glasses and a boldly rendered cartoon-like eye. Both these items act as signs referring to different ways of seeing, and both are situated at the centre of the canvas under a sand relief structure that takes the form of another of Tàpies favoured objects at this time - a hat. The hat-like form seems to convey a sense of mental life and is certainly the arena in which the most dramatic activity of the painting is taking place. Seeming to have materialised out of the ethereal blue surface of the work, this form is scarred and incised and almost obliterated by four raw and vital red stripes pasted firmly over it at the top of the painting. The complex interlacing of painterly form, symbol and half-realised imagery in this work creates a sense of ambiguity that reflects the ambiguous relationship between the artist and his creation. "I set down the signs in an intuitive and spontaneous manner, which quite simply pleases me," Tàpies has remarked... When I work, I don't analyse why I choose one form or another. Naturally I can do that afterwards. For many years I have worked in an almost automatic unconscious way." (Ibid, p. 7). In this unconscious and almost ritualistic way Tàpies explores a mystical realm into which he as the artist is immersed. 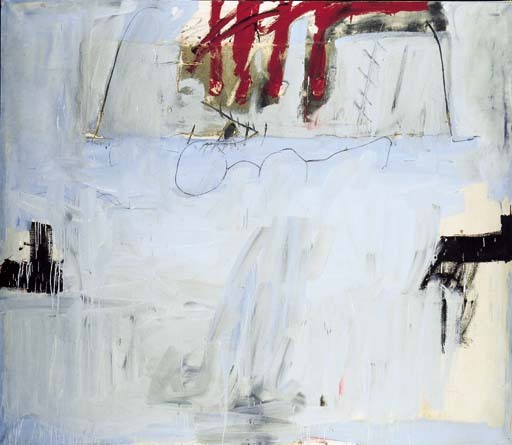 Recognising this, the autobiographical ephemera of this impressive painting which is itself both immersed in and emerging from the painting reflects and is a comment on Tàpies' growing awareness of mystical realm of creativity as ultimately, a personal voyage of self discovery. "The mystical consciousness - almost undefinable - seems fundamental for an artist. It is like a "suffering" of reality, a state of constant hyper-sensitivity to everything that surrounds us, good and bad, light and darkness. It is like a voyage to the center of the universe which furnishes the perspective necessary for placing all things of life in their real dimension." (Ibid, p. 56).